Positively impacting healthcare systems in the global community. Sustainable solutions that support healthcare systems worldwide. Congratulations to the entire GIS team, the hard working laboratory staffs and respective county management for the 8 newly ISO 15189 accredited labs! Our partnership with the Centers for Disease Control and Prevention to provide assistance in Western Kenya. GIS just received our year 4 PEPFAR funding for 2018. Congratulations to our hard working team in Western Kenya. Explore work we’ve done around the globe. Read about our current engagements. Global Implementation Solutions (GIS) is a Chicago-based non-profit organization, 501(c) 3, incorporated in May 2009. GIS is organized and operated exclusively for charitable, scientific, and educational purposes, and more specifically, to provide support that improves healthcare systems in resource limited countries. GIS seeks to advance, improve and promote the health and well-being of others worldwide. GIS is poised to provide international partners with project management and implementation solutions to help develop sustainable programs. We are dedicated to developing human resource capacity within Kenya by hiring local staff, consultants and health experts to implement our programs. GIS‘ primary programs are implemented out of our office in Kisumu, Kenya. The program focuses on laboratory capacity strengthening throughout nine counties in Western Kenya. GIS also implements One Health projects and biosecurity-aimed programs throughout Sub-Saharan and North Africa. Our mission is to provide customized sustainable solutions that support the strengthening of healthcare systems worldwide. Our vision is that our efforts and contributions will make a positive impact on healthcare systems in the global community. Within a span of six months, GIS presented 10 labs to CDC for enrollment into RRI accreditation mentorship, and produced recognizable star rating results, with 7 of them receiving National and CDC recognition courtesy of harmonized, synchronized and synergized accelerated ISO 15189 accreditation mentorship. There are 231 health facilities supported by GIS. 105 of them are transfusing facilities and 38 are directly supported by GIS on Blood Safety activities. 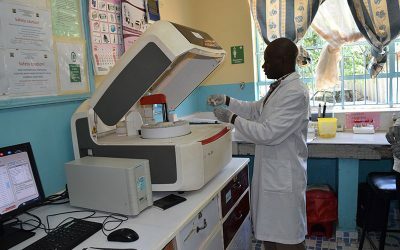 GIS works closely with MOH and CDC as well as relevant partners working within the Western Region, to strengthen county laboratories to plan for, achieve and sustain quality assured laboratory services. One of the strategies is to capacity build the laboratory personnel through trainings. 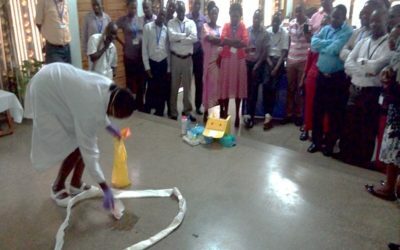 Biosafety and Biosecurity training is one of the major training being a key element in delivery of quality services.